Includes 4 Fonts, 67 Quilting Stitches, Elongation, 16 Styles of 1-Step Buttonholes, 37 Straight Stitch Needle Positions Left to Right, Walking Foot Attachment, Box Feed, Auto Needle Threader and Thread Trimmers, Knee Lever for Presser Foot, 12x24" Extension Table, up to 900 SPM Speed, 10 Presser Feet, Weighs 22 Pounds. *Synchrony 12 Months No Interest Financing at $87.50 for 12 Months, Equal Monthly Pay plus any applicable taxes. Transaction Code 112. Apply online. Synchrony will advise you of your maximum amount or full credit that you can use towards purchase. AllBrands is a Juki Authorized Dealer and Service Center for any repairs including warranty parts, electrical and labor. We give unlimited technical support by email, fax and phone. We service machines in our stores. Mass merchants do not have tech service or repair departments for your equipment. They are unable to help you directly, only referring any operational, mechanical or electronic questions back to the manufacturer instead of taking care of the problems themselves. Manufacturers and customers should expect that any problems you have will be taken care of by the dealer or merchant who sold you the equipment, not by just referring your questions back to the manufacturer. Frequently used stitch patterns can be selected directly through the direct select mode. 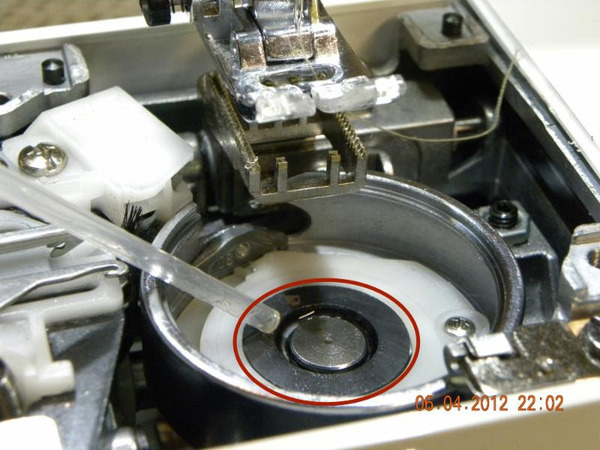 The new HZL-F series trims both needle and bobbin threads automatically by pressing the heel side of the foot controller. With this feature you can concentrate on your project while automatically cutting the thread. The F600 will create the width of select quilting stitch patterns automatically and at random. This will give your quilting project an enjoyable look without any hassle. The HZL-F series has powerful feeding thanks to a special steel feed dog and improved presser foot construction. Heavy material projects, such as hemming denim jeans, can be sewn with ease. Presser foot can be raised and lowered by the knee-lifting lever. Presser foot lift is up to 12mm when the lever is used. LED lights brighten the needle area and sewing are for better material handling. HZL-F Series has a wider underarm space, with a wider table it is more enjoyable and comfortable to work with large projects. 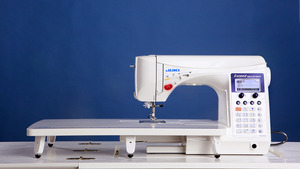 Juki HZL-F600 Sewing Machine Review by The Crafty Gemini. In this video I review my new Juki HZL-F600 Sewing Machine. There are also two other models- the F400 and the F300. The HZL-F600 machine features 225 stitches, an extension table, 12 different presser feet and several other accessories. Knee Lever Socket shown below Stitch Selection Panel Board, is for you third hand, allowing both of your hands to insert fabrics under presser foot, do free motion work, and remove fabrics without having to manually lift the presser foot lever shown on the back of the machine. Accessory storage tray extends bed size to 12" length. Top cover reveals stitch selection modes and thread guides. Presser feet and tools store inside slide tray, readily accessible for use. Stitch Selection Panel with overrides for stitch width and stitch length control. 12x24" Extension Table and Knee Lifter Bar Included. Foot Controller can be used for start/stop, speed control, and thread trimming (depressing heel instead of foot pedal). Knee Lift clamps to bottom of extension table for storage. Once I figured out to put the foot feed up to thread the machine, I solved my tension problem. FYI: I use a MAC Pro and they don't come with CD's. Wish I had a way to view the CD ! "Love my new Juki HZL f600!" I have one and I love mine. I would say this the best sewing machine I have ever owned. I've been buying my JUKI machines from your company since 1999. When I need the new Juki Longarm I will be buying it from you as well. I love your service, your prices, and your people are the most helpful and friendly out there. I lived in LA for many years and I know when I call your company I will be reminded how pleasant the people from LA are. It is a pleasure to shop at Allbrands. Service was great and delivery was great. José Guillermo Pérez Luna, Puebla, México. I'm from Puebla, Mexico, I bought my wife Juki machine in January 2013. I see that she is very happy now that she is using the stitches and feet that are very useful for the seams you want to perform. Here in Mexico there are no stores where I can get, so I purchased online from AllBrands. It was very useful, as arrived very quickly. I see that my wife is very happy with the machine, many graciasl AllBrands. I researched sewing machines for three years. This purchase would be my dream machine. I FINALLY found it!! This has everything I wanted, everything the really expensive machines had, at a great price. I can't find anything I don't like or that I would change. It is easy to use, VERY quiet and sews smooth as butter. Take advantage of my research...you won't be sorry! I placed my order on a Friday morning and it was shipped the same day. I've been a customer since 2008. Great place to do business. Excellent service. It took me 10 days to decide on such an expensive order. Customer service was patient and courteous at all times. Answered ALL my questions and helped me place my order. Thank You. I have my eye on a Juki serger now.